Flexmonster is one of the leading team that provided custom Flex applications development services and specializing in Rich UI extranets, dashboards and music/video streaming solutions. Developing Flex/Flash components (like Pivot table, LiveArt) and consulting about it integration is another service line of our company. Powerful components combine best practices in programming and UI design. Qweas is providing links to Flex/Flash components, RIA - FlexMonster 1 as a courtesy, and makes no representations regarding Flex/Flash components, RIA - FlexMonster or any other applications or any information related thereto. Any questions, complaints or claims regarding this application Flex/Flash components, RIA - FlexMonster 1 must be directed to the appropriate software vendor. 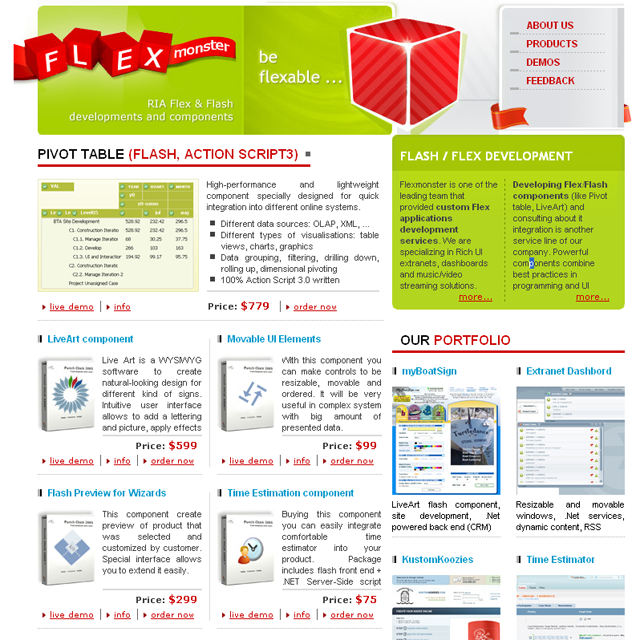 You may click the publisher link of Flex/Flash components, RIA - FlexMonster on the top of this page to get more details about the vendor.